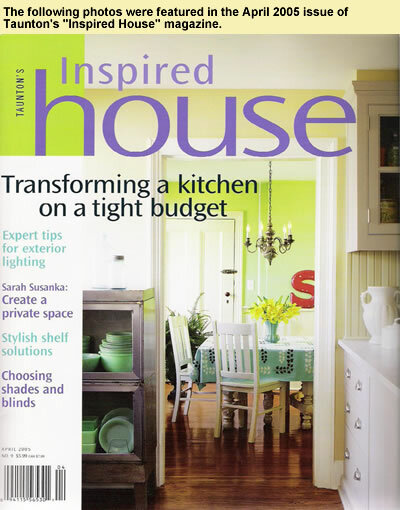 Designed by Jean Larson (author of “The Farmhouse”, by Taunton Press), with Steve Mooney and Greg Graton, this home was featured in the highly acclaimed book, “Creating The Not So Big House” by Sarah Susanka. 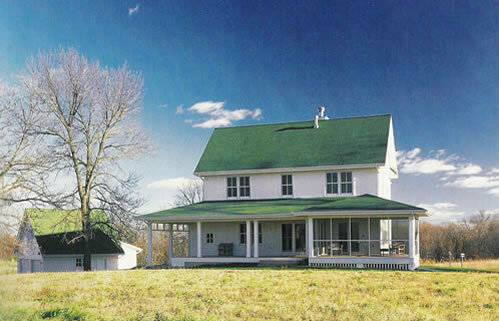 This new farmhouse looks like it belonged to the land in its agrarian past. 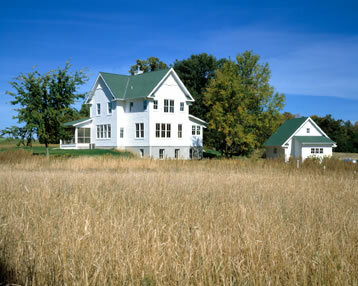 The house is nestled into the east side of a knoll, and looks out onto a pasture of wild grasses. 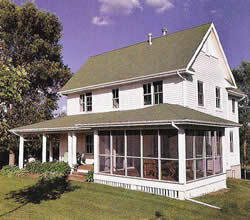 Its form revives the simplicity and good proportions of classic farmhouses seen across the rural areas of the Midwest. 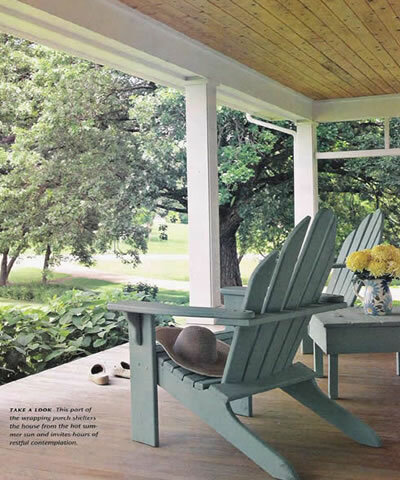 The front of this classic house has a 9–foot deep front porch that connects to a screened porch that extends beyond the right edge of the house. 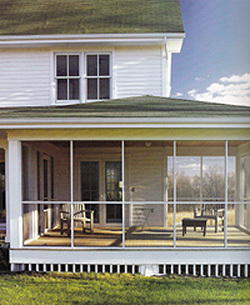 Some of our customers have had the porch extend all the way to the corner, and then added a screened porch off the dining room. 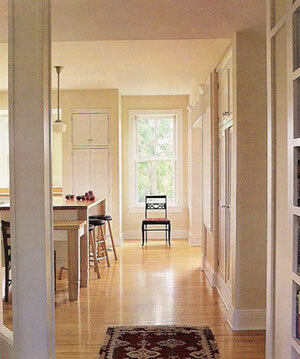 A pair of glazed doors open to the foyer. 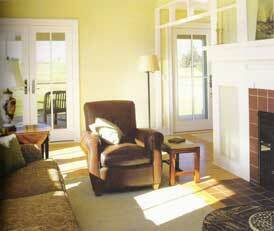 The living room is on the right, and double doors on the left open to a library/study. Straight ahead the original homeowners wanted a free–standing fireplace facing the living room, with built–in bookshelves on the other three sides, but this fireplace could of course be removed or repositioned if you’d like a larger and more open living room (which would change from 13’x19′ to 21’x19′). 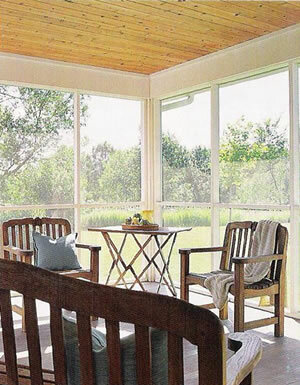 A pair of glazed doors in the living room open to the screened porch, and more light and views are available from the windows that line the outer wall. Like all the rooms on this level, the ceiling is set at a comfortable 9′. 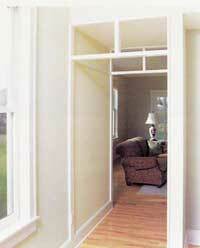 The wall between the living and dining rooms is also optional. It’s designed to hold a media center and a buffet, but without it the dining room expands from 11’6″x12’6″ to 16’x12’6″. 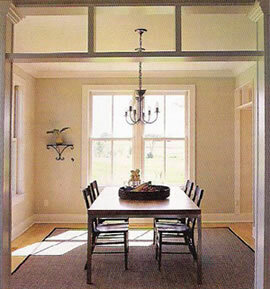 The dining room features lots of windows on two walls, and a pair of columns provide a wide opening to the kitchen. 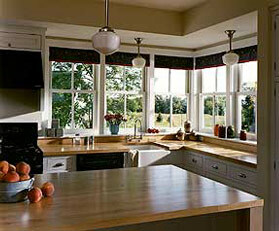 The kitchen has room for a large center island with a conveniently located desk at one end, and two small pantries. 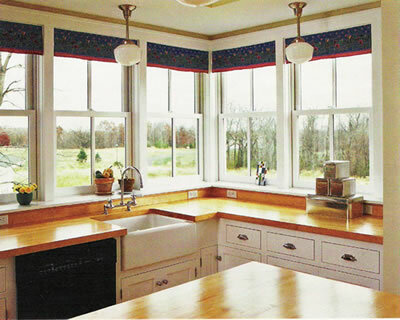 Again, windows line two walls for plenty of light and views to the rear and side. Just off the kitchen three stairs step down to the family entry space. From here there’s access to the side of the house (where the detached garage was located), a mudroom with closets and a powder room, and the basement level (should you choose to construct it). 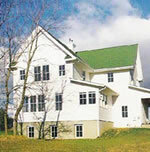 Upstairs there’s a master suite and two bedrooms. The master bedroom has windows facing the rear and one side, and a huge walk–in closet, while the bath has both a tub with a view and a shower. 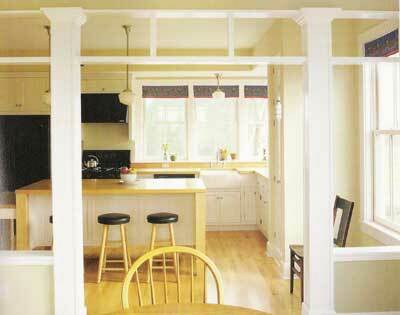 The two other bedrooms are identical in size, each with views to the front and sides, and they share a full bath. 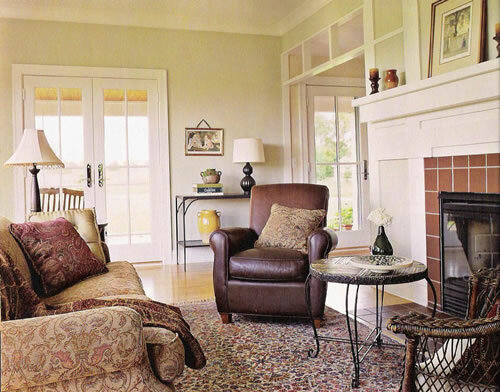 If you need a larger living room, it is a simple affair to extend it to match up with the screened porch at the front of the house, or even further. The reason why it is fairly is that the expansion follows the simple crossing roofline. 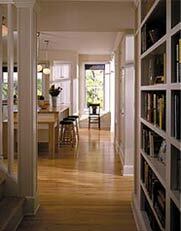 And doing so would also add a bit of space to the master bath upstairs as well as one of the bedrooms. We now have another version of this home, called Field of Dreams 2. 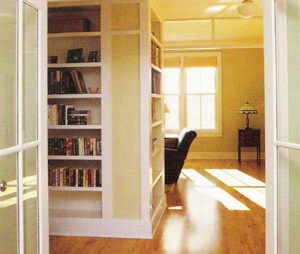 In this version, the garage is attached to the house, the mudroom area is expanded, as is the library, and the second floor has a slightly different configuration that includes a laundry. 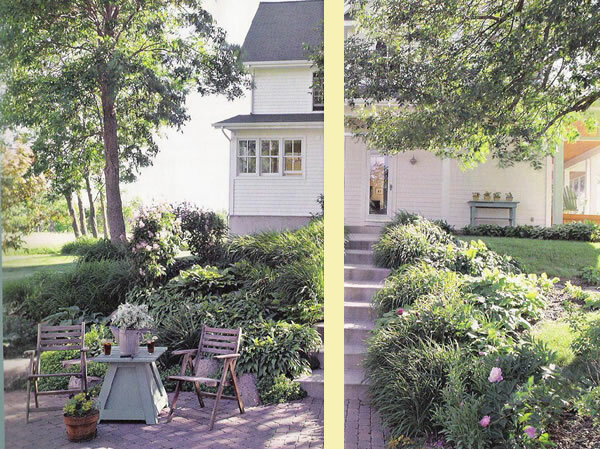 This house seems to fit everyone's memory of old farmhouses. It's been a best–seller for as long as we've been in business, and when you see the photographs you will see why. 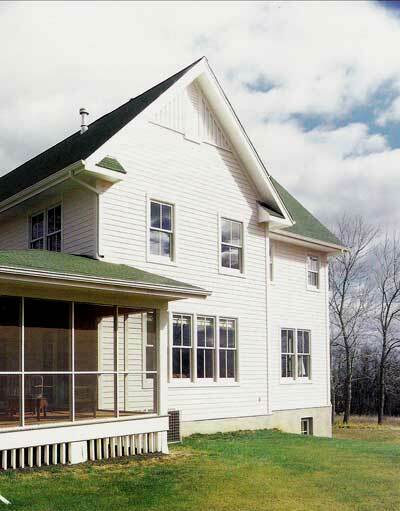 Like all great farmhouses, it features clean outer walls that rise straight from the ground to the eaves of the gabled roof, and a covered porch next to a screened porch span the entire front of the house.